Former NFL coach Sam Wyche. PICKENS, S.C. — Sam Wyche looks good for 71. Darn good. He stands in the garage on his 28-acre property 122 miles southwest of Charlotte, in the shadow of the Blue Ridge Mountains. A couple of days earlier, he got on his bike and rode 19 miles on a path in and around Pickens and nearby Easley. “Man, that felt great,” he said. Not a lot of 71-year-olds ride 19 miles—and he rides his bike about five days a week. They especially don’t do that nine weeks after receiving a heart transplant. “This Thanksgiving,” Wyche said, misting up, “means a lot more than any Thanksgiving I can remember because I, by all right … I am about to lose it here…” And it looks like he will lose it. Wyche shows off his scar following heart transplant surgery. The mystery donor. Wyche hopes to one day thank his family, but that decision will be totally up to them. For now, Wyche’s purpose in life will be to encourage organ donation. He will push registerme.org online. He’ll preach organ donation every day for as long as he lives, the way he used to preach the most bizarre, imaginative offense in the NFL. I can’t promise you won’t tear up at some point. I did. This is also a bit of a personal story. The first year I ever covered pro football, I covered Wyche. We were rookies in 1984, he in his first year as an NFL head coach with the Bengals and I as the 27-year-old beat writer for The Cincinnati Enquirer. One of the reasons I wanted to write this story (and record such a memorable podcast) is because Wyche is one of the most unforgettable people I’ve ever covered, and one of the most interesting coaches. The story starts in 1984. At one of our first meetings, the day before the 1984 NFL draft, Wyche told me whom the Bengals were going to draft and said it’d be fine if I wrote it. He was possibly the most open head coach in NFL history. He just figured no one would ever know—and in the pre-internet days, no one did. With Wyche’s help, I aced five of the first six picks, in order. (I missed on late-first-round pick Brian Blados.) My sports editor’s jaw dropped when I hit on third-round pick Stanford Jennings, the Furman running back. I picked up Boomer Esiason, the second-round quarterback from Maryland, at the Cincinnati airport on draft day in my two-door Volkswagen Rabbit, surreptitiously evading the car sent by the team to ferry him to team offices. Esiason wasn’t too happy trying to fit into the little car. “Welcome to the f---ing NFL,” he said with disdain when he saw his ride. That summer, I lived in the Bengals’ dorm at Wilmington (Ohio) College. Wyche was in the RA suite down the hall from my room, and he told me to just stop by if I ever had any questions, and I did—probably 10 times in five weeks. There were two pay phones in the dorm, so players—especially Esiason, and sometime wide receiver Cris Collinsworth—would stop by my room on the ground floor to use my telephone. I watched full training-camp practices on the Wilmington College sideline with owner Paul Brown, and one day I complained about the stifling heat and humidity. “Ever get tired of being out here four hours a day?” I asked. Wrong question. “Young man,” Brown said pointedly, “This is our lifeblood!” I took that as a no. There are other stories, one involving Wyche and a tuxedo and a white rabbit … another involving Collinsworth and Wyche and a magic show at a Cincinnati group home at Christmas. Listen to the podcast and you’ll be entertained. Wyche did have a fuse, though. There was the time, before a November game against Seattle, when he was convinced I’d brought a Seattle-area scribe to practice to spy on the Bengals. He lined his players up, called me out of the football facility, and ordered me off the premises, loudly, to the catcalls of the approving players. Then he called my editor saying he wanted me off the beat. I hated his guts for about three days. But it was hard to hate Wyche for very long. A few days later, it was like it never happened. And the football stuff: Wyche was just south of Bill Walsh—one of his mentors—on the imagination scale. 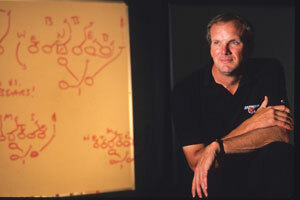 Wyche was Joe Montana’s first NFL position coach under Walsh with the Niners. By the time he got the Bengals’ head coaching job, in 1984, he was determined to do it his way. That included silly names for plays, and formations the players had never seen before. Like “Mantle” for a play that had a “61” in the long name. “For Mickey Mantle and his 61-home-run season,” Wyche explained. Wyche poses next to a play he drew up for the Bengals in 1989. His way also included using something that no one did at the time except during two-minute drills: the no-huddle offense. In 1982, on the Niners’ staff, he saw what a weapon track star-turned-wideout Renaldo Nehemiah was on deep routes, and he thought, What if a speed guy like Nehemiah could tire out a secondary and a defense, and the offense went right to the line at the end of a play and prevented the defense from substituting? And when Wyche got the chance to run his own team, he eventually sprinkled it in, enraging the football establishment. Along the way, he made enemies. He and then-Oilers coach Jerry Glanville had an intense rivalry that boiled over a few times. (Glanville believed football should be a smash-mouth slugfest; Wyche thought the game was ripe for trickery and innovation.) Wyche enraged the city of Cleveland when, after Cincinnati fans threw things on the field during a 1989 game, he said on the stadium PA: “You don’t live in Cleveland! You live in Cincinnati!” The league office repeatedly battled with Wyche, and nearly suspended him once, for his refusal to let female reporters in his locker room long after it had become common practice. On the field, in the 1988 playoffs, Seattle defensive players faked injuries when the Bengals went no-huddle. And in the AFC title game, against Buffalo, Wyche got word (you’ve got to hear his full explanation in the podcast) that the league, angry that the no-huddle was making a mockery of the game, would call unsportsmanlike conduct if the Bengals used it in the game. There was nothing in the rules against it, but it looked so different. Wyche held his ground, claiming the league couldn’t change the rules right before the conference championship game. The Bengals used it, they didn’t get flagged, and won. Sam Wyche and Boomer Esiason in 1990. After his head-coaching career ended, in 1995, Wyche took a meandering path that began with TV (his left vocal cord was accidentally severed during an operation, ending a promising media career in 2000). He then worked as a substitute teacher and coached high school football in Pickens, where his wife, Jane, was born. In 2004, he was back in the NFL, working as an assistant on Mike Mularkey’s staff in Buffalo; he also served on the county council in Pickens. He contracted the degenerative heart disease cardiomyopathy 13 years ago, and it was only a matter of time before his heart would give out. That happened on Aug. 14. Wyche was clearing some downed trees on his property with a chainsaw. When he walked back to the house after the job was done—a distance of maybe 15 yards up a very slight incline—he was out of breath. The next day, his cardiologist sent him to a hospital in Greenville, and for the next couple of weeks he underwent tests and generally felt lousy. On Sept. 1, Wyche entered a renowned heart facility at the Carolinas Medical Center in Charlotte. They told him he needed a transplant. Days passed. Sept. 9 was the deadline for the installation of a pump that would help Wyche live longer but cause him to be mostly bedridden. He didn’t want the pump, fearing a strictly sedentary life. By then, Wyche likely had less than a week to live. There are approximately 2,500 heart transplants a year in the United States; the Carolinas Medical Center averages about 25. “Coach was sick when he got here, and declining rapidly,” said cardiologist Sanjeev Gulati, the medical director of Heart Failure and Transplant Services at the facility. A team of about 15 at the center—including transplant surgeons, cardiologists, nurses and a social worker—meet each Monday to prioritize patients on the list, and Wyche’s condition was so dire he moved to the top of the list; if a heart within a several-hundred-mile radius could be found and harvested, and if it wasn’t a better match elsewhere, Wyche would have it. Easier said than done. Carolina Panthers owner Jerry Richardson, a heart-transplant recipient himself, visited twice and sat on the edge of Wyche’s hospital bed, not in the adjacent chair. He told Wyche he’d be fine if he got a heart. “To these doctors,” Richardson said, “it’s just like changing a tire.” But he told Wyche an infection could kill him, so he should constantly wash his hands and use sanitizer—be maniacal about it. No heart on Sept. 9, a Friday. No heart on Saturday. No heart on Sunday. “I didn’t want to think about it too much,” Wyche said, “but I knew that I had the weekend to find a heart and if I didn’t find one, the only alternative was that I would go ahead and pass. Well, Monday comes along. Monday morning the doctor comes in. “We didn’t think he was going to make it,” his wife, Jane, said. That afternoon, unbeknownst to Wyche, two high school football teams in Cincinnati gathered on their practice fields. His son, Zak, is a coach at Purcell Marian High School. His grandson, Sammy, is a player at football power Moeller High. Wyche is well liked in Cincinnati still, and word had spread that he was awaiting a transplant, and time was short. Both teams, separately, gathered en masse on their practice fields and prayed aloud for Wyche. That was at about 5 o’clock. For a heart to have the best chance for successful transplantation, it should be harvested and put into the recipient within four hours. This one took longer. Surgery began at 2:30 a.m., nine-and-a-half hours after they got the word of a donor match. Though Wyche doesn’t know the donor’s name, age or situation, the theory on the match is that Wyche was fairly healthy, lived a clean life, and the donor had a very strong heart. A surgeon from Wyche’s medical team harvested the donor heart—privacy laws prevent any disclosure of who donated it or where the heart came from, or how it was transported to Charlotte—and rushed it into the operating theater where another surgeon was removing Wyche’s damaged heart. In the wee hours of Sept. 12, the donor heart was placed in Wyche. The surgery, performed by a team of seven doctors, lasted four hours. For about 48 hours, Wyche was woozy. On Wednesday, late in the day, he finally had his wits about him. I asked Wyche: Do you remember what you were thinking as you were in and out of consciousness, or dreaming before you woke up? Sam Wyche and his wife, Jane. For now, Wyche will ride his bike three to five times a week. He’ll live in his 30-by-30-foot luxury man cave a few yards from his house, isolating himself out of fear of infection. Jerry Richardson, you did your job: Sam Wyche is absolutely nutty about keeping germs away. When I met Wyche last week, he wouldn’t shake hands. “Fist bump!” he said, greeting me. He uses hand sanitizer all day long, and there’s a bed and a bathroom inside the man cave, with a gigantic 12-point elk head on one wall and three shotguns on another. The Wyches have two rescue cats, two barn cats and four rescue dogs … all in the main house with Jane. Sam, for now, will not be around them. He stays out in the man cave, and works on projects in the garage, and rides his bike. Before his Thanksgiving meal, he’ll say a prayer for a man he never met, the man whose heart beats inside his chest. You can learn about the gift of life, organ donation, at registerme.org, or organdonor.gov.